The Basketball Spotlight Future Phenom Camp Class of 2025 gave us a glimpse on some of the top talent coming down the pike. Here’s Part 3 of our top performers. JJ Addison Forward (New York)- I was kind of reluctant to write forward next to his name because Addison handles, creates and shoots like a guard. Because of his size he played the forward role during the Future Phenom Camp. He was matchup nightmare all weekend. He was too big for the guards and too quick for the forwards. I like how he sliced through the lane and stretched out for long finishes. He also got rid of defenders with a slick handle and usually went right into his shot afterwards. He made the All Camp Team and finished ranked #3. 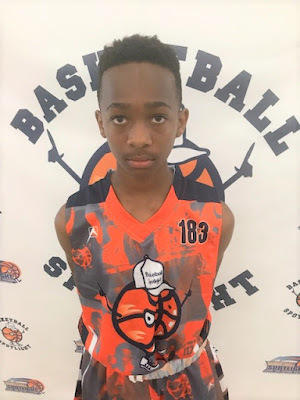 Semaj Long Guard (New Jersey)- Long is a very vocal point guard with ultra-quick moves. He looked very good in the pick and roll situation. He was a demon in transition. He also proved he could setup teammates and drain the outside shot. He also made the All Camp Team, played in the AGame All American Game and finished ranked #4 in the camp. Warren Keel Guard (Massachusetts)- Speaking of guard play this kid Keel has a lot of wiggle in his game. He uses an array of dribble moves combined with a tough hesitation move. His dribbling moves makes it easy for him to get past defenders and get a bucket. He finished ranked #17 in the camp and played in the AGame All American Game. Lucas Scribner Guard (Maryland)- When you see Scribner play think of John Stockton. Lucas penetration skills puts constant pressure on the defense. He directed traffic and seemed to make the correct pass when he had too. He was a very vocal leader on the floor. He played in the AGame All American Game. Richard Rosa Guard (New Jersey)- Rosa is a smooth finisher. His strong shoulders allow him to move defenders around absorb contact before getting the bucket. He knows how to operate on the perimeter and in lane. He finished ranked #16 in the camp and played in the AGame All American Game. It was well deserved. Khaliq Carson Guard (Maryland)- If you trying to slow down Carson good luck. The dynamo guard stays in attack mode while keeping defenders on their heels. He hits the gaps in a blur which allows him to create for himself or teammates. He finished ranked #18 in the camp and participated in the AGame All American Game.